Welcome to your source for everything Puppets! 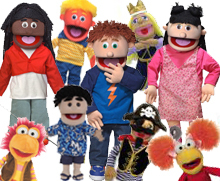 We offer a huge selection of puppets for ministry, schools, therapy and fun! Our puppets offer great educational value; they inspire personal expression, promote self-esteem and initiate peer interaction. JumpNPuddles was designed for your easy shopping convenience. To the left we have 100's of puppets in many different categories for you to choose from. We carry the 10 major brands of puppets from the 15" glove style puppets, 28" full body puppets, 30" professional puppets, children's puppets, half body puppets, finger puppets and marionettes. Stories from the bible will come to life with the use of our ministry puppets. Our biblical puppets are great for entertaining and teaching biblical truths. Children participate in the lesson with the use of biblical puppets and they feel like they are part of the story. 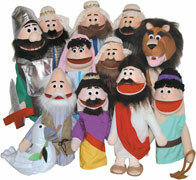 We carry a wide variety of biblical puppets from Jesus, Mary, Noah and Moses to Christian kids and animals. And of course we have a zoo full of animal puppets. They are a great teaching tool, helping children learn about the environment, conservation and nature. 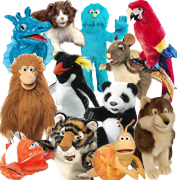 We carry a large selection of different types and species of animal puppets, from monkeys, bears, fish, and farm animals to reptiles, insects, desert, forest & jungle as well as many dog and cat puppets. We also carry the full line of Folkmanis animal puppets and many brands of finger puppets. 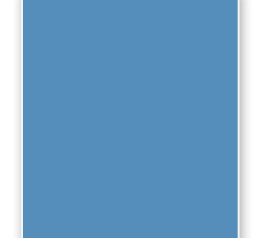 So go ahead browse our vast selection of puppets; you are sure to find the perfect puppet for your needs.